They tell you that when you go to Vegas you should avoid the flashy and sparkly slot machines; that they’re a trap. I wish I could say that I did just that, but dammit they sucked me in. Big lever, I’m there. Diamonds, I’m there. Rainbow lights, I’m sooo there. We went in thinking that we would gamble $100 each, which for me was steep and anxiety-inducing already. We fantasized about sitting down at a smoky card table with a bunch of mustached men and shocking them with our skills, of which we had none. We knew if we wanted to win anything this was the way to go. So instead we firmly decided to play it safe. We’d do Vegas our way and not gamble. Who said we had to gamble anyway? We walked through numerous casinos every day and didn’t feel the pull because we wanted to be responsible. From start to finish we planned economically and thoughtfully. From our snack bag on the plane to checking our boxed wine to granola bars for breakfast, we were going to prove that you didn’t have to break the bank in Vegas. We had both been gifted a bag full to the brim of snacks from our mutual boss. Caramel corn, potato chips, peanuts, boxed wine and more! We each took one as our carry on bag to Vegas. As dorky as that looked, saving money tactic one was put in place. We learned from our trip to Japan (see, Comfort Me With Tempura: Our Trip To Japan) that a sufficient amount of snacks, even if it seems excessive, is absolutely necessary when taking a long trip. We felt safe and secure with our full bags of provisions and prided ourselves on being so crafty as to check our boxes of wine. These lasted us the whole trip and we drank them like the girls you see in those fancy, staged Instagram posts in our private hot tub that looked over the strip that we were given as an upgrade. This good snack packing karma really set the mood for the whole trip. Deciding to do Vegas our way was so freeing. We weren’t going to let anyone else tell us how to do it, when did we ever listen to anyone else anyway? While we stayed true to character and planned every minute of every day in Vegas, there was one thing that went very unplanned. On night two we splurged on a sushi dinner that left us underwhelmed and unsatisfied, to put it mildly. Sushi should never make you feel like that. We usually go all out on a sushi feast that’s eaten on my living room floor, but that’s not how sushi works in Vegas. As we walked out of the dark and sultry restaurant into the bright, neon casino lights our pace was slow and disappointed. How could we save this night? No one should feel sad in Vegas for crying out loud! In an instant, Laurel grabbed onto my hand and pulled me to sit next to her at a slot machine, both of us sharing the one tiny seat. It was like there was no time between standing and sitting, all of a sudden we were thrust into it and money was going into the machine and we were transfixed on the screen. We had no idea how to play but we just began to hit buttons. Money kept going in and but none was coming out. We looked at each other and said this is not the machine for us. We got up and began to asses the situation around us, meandering in and out of the cigarette-strewn chairs and entranced gamblers. I looked up and saw a huge machine with a big, bright diamond and a colorful lever whose handle was illuminated. “Diamonds!” I said. With bulging eyes and laser focus I walked directly up to it. We sat down, put in some money, held hands and closed our eyes. We wanted to cultivate some good friendship juju as we referred to it. We talked about what we were thankful for and how we were just going to play for fun and not be greedy. People walked by and looked at us like we were silly little girls, but it didn’t bother us. Because again, Vegas was being done our way. I pulled the lever and the machine spun rapidly. We won a few dollars and lost a few dollars, so we kept going, periodically stopping to hold hands and close our eyes. Suddenly I pulled down the lever and the machine started making noise and flashing, our money kept going up until it reached $270. We looked at each other, eyes wide, smiled and cashed out immediately. The funny thing about it was that in a continued effort to do Vegas our way, we bought spur of the moment tickets to see The Backstreet Boys a second time at dinner a little earlier. We had seen them the night before, which is why we were in Vegas to begin with. The tickets were $200 to see them the next night and as luck would have it, we had just won that money back. Corny as it sounds, it was like Vegas was giving us a huge hug. We were doing it our way. Since we had a little bit of money left after covering the cost of the tickets, we thought it couldn’t hurt to play a little bit more. It’s hard to be completely tame and controlled in Vegas I will admit. We weaved our way through some more machines until we felt the cosmic pull from another one. We turned a corner and there it was - the Willy Wonka slot machine. The giant screen flashed with candy pieces and the speakers played the oompa loompa song. This was it. Could there be a machine made more for us? No way. We sat, went through the hand holding ritual and started playing. 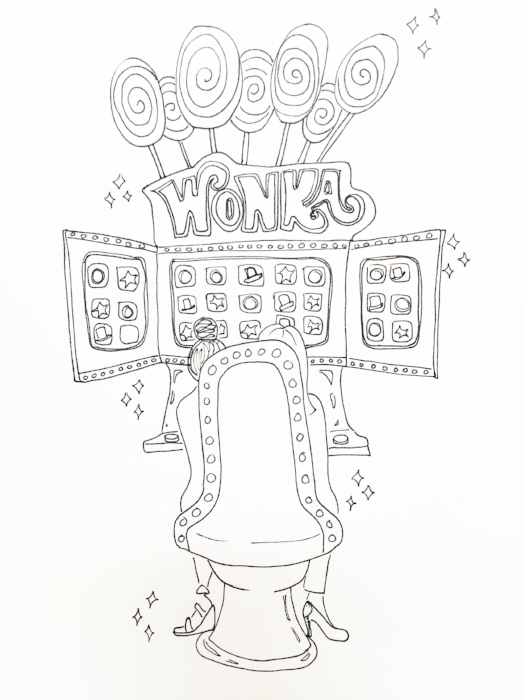 Every time we’d unleash the Willy Wonka Winko bonus and chocolate pieces and gems started rushing by on the screen, leading to a win, I smiled like a little kid as Laurel watched it with the focus that a surgeon has on the job. Bells and melodies played and I bounced in the seat as our money went up once again. We cashed out and decided to call it a night. The best part was using the cashout machine, which is basically an ATM that gives you free money. We were stunned to be walking around with almost $300 cash that started as $25. That’s doing Vegas our way! We headed back to our hotel room and sat on the couch and ate our potato chips from the snack bag to make up for the lack of dinner we had. We danced around the room like little kids, rejoicing in the fact that when we stay true to ourselves, the best things happen. I was reminded that when I do what my gut says I get the best results, ones that are genuine to me. We left Vegas feeling refreshed and rejuvenated, something that most people can’t say. We didn’t break the bank, but we ate well, we explored, and most of all we had FUN. Our kind of fun. Who’s to say that the flashy and sparkly slot machines are only for suckers? !